People continually argue about the difference between Mambo and Salsa. Some say they are the same thing. Others say Salsa is something you eat! Still others think Salsa is a generic label for all different types of “Latin” music. If you listen to the early Mambo of Tito Puente, Machito, Beny More, Tito Rodriguez as well as many other greats who started playing before 1960 you’ll hear a certain sound, then listen to some of the newer folks on the block, you'll find a distinction easily enough. Is the new “better”? Hmm, perhaps a look at how we got to this point in the music and discuss who is who is in order. Of African and European parentage, the Mambo is the result of a long cross cultural journey, an example of the kind of sensual alchemy which is a specialty of the Caribbean. Mambo, Conga and Bongo were originally Bantu names for musical instruments that were used in rituals and gradually became secular. Mambo means "conversation with the gods" and in Cuba designates a sacred song of the Congos, Cubans of Bantu origin. The Congos have absorbed a variety of foreign influences and the mambo is a delicious cocktail of Bantu, Spanish and Yoruba. Despite its strong African resonance, the Mambo also can be traced back to an unexpected source, English country dance, which in the seventeenth century became the contredanse at the French court and later the Contradanza in Spain. In the eighteenth century the contradanza reached Cuba where it was known as Danza and became the national dance. Its hold grew with the arrival of the planters and their slaves who fled from Haiti after it became independent. The Haitian blacks added a particularly spicy syncopation to it called the cinquillo, which is also found in the tango, itself derived from the Contradanza. Gradually other black elements found their way into the contradanza, some titles of which reflect this blending are "Tu Madre es Conga" ("Your mother is Congo"), which was played in 1856 in Santiago de Cuba at an aristocratic ball in honor of General Concha, and "La Negrita." From the beginning of Jazz musicians in the USA have been incorporating these rhythms into their own music. In 1900, W.C. Handy visited Cuba and began our legacy of Latin jazz here in the USA. Louis Armstrong, Jelly Roll Morton, James P. Johnson, Dizzy Gillespie, Charlie "Bird" Parker, Stan Getz and Cal Tjader have all followed the tradition by blending and evolving Latin jazz. Gillespie added a Cuban drummer named Chano Pozo to his band in 1938 and they began to compose together. This collaboration plus advances in recording technology after WW2 started a “great leap forward” for the music. Even the less esoteric forms of music in the USA have sampled Latin rhythms and incorporated them with great success. Sam Cooke, The Diamonds, Johnny Otis, Elvis Presley, Bo Diddley and Nat King Cole all helped popularize Latin music with hits containing elements from Cuban music. Gloria Estefan is one of the most well-known contemporary performers who popularize Latin music in the USA. She has very successfully blended English lyrics and rock and roll R&B style with her Cuban musical heritage. To find the roots of Cuban music we have to look to West Africa where the slave trade thrived. The Yoruba, Congo and other West African people created rhythms in ancient times to call forth various gods. Sadly, these wonderful rhythms were brought over to the New World under dire circumstances. One drummer (research leads me to believe his name was Ijibwa) was taken captive and placed on a slave ship for America. He was forced to play on deck to keep up the spirits of the prisoners so that the "merchandise" would arrive alive. The slaves used the drum rhythms in Christian worship too. Slaves were forced to adopt Christianity upon arrival in the new World, but often called their own gods by Christian names so as to avoid punishment. A similar practice was the progenitor of the "Yo Mama is so..." jokes in existence today among African-Americans.” Mama" was actually a code word for "Master." Hardly anyone telling these jokes today remembers what "Mama" actually stood for in slave times. In Latin music of today most of the listeners are not even aware that the drum rhythms we dance to are actually religious in meaning, dedicated to various African gods. Cabillolos (secret societies) still exist in Cuba and the United States and keep alive over 200 different rhythms for different African gods. 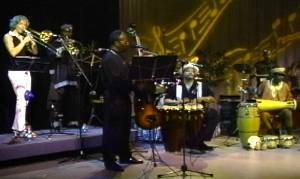 With that said: As a “Latin” (Afro Caribbean) Jazz Musician I noticed quite a bit of resistance to our (Afro American) style of Salsa. As an original member of Willie Colon and his La Dynamica Orchestra, I’ve been around Salsa a long time. With a few members of a World Music band I started in another era we formed a new Orchestra playing a style of Salsa, Jazz and Caribbean colors we’ve always wanted to play. By strongly following the Jazz tradition of pulling from all types of song material that has the potential to generate that “swing sound” we’ve grown to love. But then there are the cultural gate keepers. When this subject is brought up most music lovers don’t really believe it to be true. I wasn’t dreaming when the owners and directors of the leading Latin record company of the day said to me “move on to other music” and “don’t try to pursue ANY recording opportunities playing Salsa music” with their label. Heck I grew up in the Bronx just like them! My father was a jazz musician who was born in Barbados! Plus the guys who came to jam with my Father at our house all to a man played the Mambo! But I can’t play the Mambo for them because I’m an African American? Please any excuse but that one! I didn’t know at the time I had to change my name to Hernandez or Diaz to “join the party”? I found out recently through my own research I wasn’t the only one this happened to. 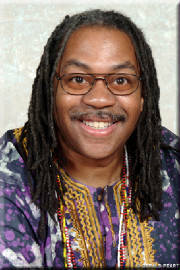 Dr. Vernon Boggs, researching his book Salsiology was open to all sources of knowledge and information about our varied Latin (Afro Caribbean) music. That is why he disliked the cultural gatekeepers. Dr. Boggs may or may not have coined the phrase, but I too always associate the term with him. He introduced the notion of gate keeping in Afro-Cuban and Venezuelan Popular Music’s. His view of what a cultural gatekeeper is was published in Latin Beat issue Oct. 92. Basically, a cultural gatekeeper is a snob. Dr. Boggs wanted the public to decide what kind of music they liked to hear, not the people in the music industry who attempt to regulate the public's taste. For example, according to Boggs, the cultural gatekeepers killed the Latin Boogaloo. There are other cultural gatekeepers to watch out for, this article only touches upon the topic but is prevalent in other forms of music as well. Dr. Boggs’ main focus of interest and perhaps his greatest passion in life was Afro-Hispanic music, more specifically Salsa. This would not be surprising except for the fact that this Latin music expert was an African-American. Dr. Boggs’ love of the Hispanic culture was evidenced by his desire to learn Spanish and to penetrate the culture in order to pursue the knowledge he sought. What a better way to connect with the culture than through the music. His biggest pleasure was to find and then publish a little-known fact, to discover a piece of the salsa puzzle and to offer it to all salsa lovers. People in the know are very fond of Vernon Boggs's series of Latin Beat articles, bringing to our attention that many Doo Wop tunes curiously include titles such as Everybody Loves to Cha Cha and Mambo Baby. Dr. Boggs sang the virtues of the unsung. His many articles published in Latin Beat magazine presented relatively untouched topics: books on salsa written by authors from abroad, Latin Ladies and Afro-Hispanic Caribbean Music. The notion of a musical trans-culture that included African, Swedish and Japanese Salsa bands and dance troops, the lists are endless world-wide! 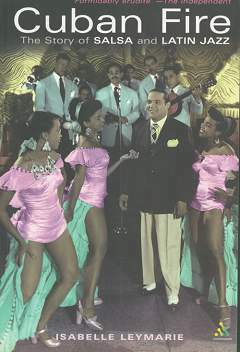 Cuba's unique blend of African, Spanish, and French cultures has produced an international musical legacy of unparalleled popularity. An award-winning author and a documentary filmmaker, Leymarie traces the history of Cuban music and its major artists from the 1920s to today with ardor and verve. Sections on musical roots, the 1940s and 1950s ("The golden age of Cuban music"), the 1970s to today, and more describe the development of distinct genres like the rumba, conga, and pachanga in Cuba, as well as in expatriate communities in the United States and Puerto Rico. Other recent excellent books on Cuban music include Sue Steward's ­Musica! : The Rhythm of Latin America; Salsa, Rumba, Merengue, and More, which is more of a coffee-table book (but with a good discography) and doesn't quite match Cuban Fire's scholarly, sequential style. Scott Yanow's Afro-Cuban Jazz is reasonably scholarly, but the scope is not as broad. Cuban Fire occupies the middle ground between those two otherwise terrific books and is the one to choose if you can't afford all three. Essential wherever books on popular music are collected. "This is a well-researched and engagingly written account of Cuban and Latin American music."